While Peabody Energy may have hired a notorious public relations firm to hawk its international ad campaign, a village trustee and her rural farming community have exposed the devastating legacy of the world's largest coal company near its historic Illinois beginnings. Meet Judy Kellen and the courageous community of Rocky Branch in Saline County, Illinois, whose battle to save their farms, homes and cherished Shawnee Hills from Peabody Energy's proposed strip mine expansion is turning out to be one of the most important watershed events in the heartland. Testifying at the Saline County board meeting last night in Harrisburg, Illinois, Kellen and her neighbors explained how a necessary county road deviation for the proposed strip mine would dangerously cut off emergency vehicle access and be a dead-end for Rocky Branch. "Our township is being destroyed as well as our county," said Kellen, as reported in The Southern newspaper. "It's going to be very difficult to live in an area where Peabody has sucked the life out of us. Every concession that has been made has been made to accommodate Peabody and it has hurt our residents." For the first time in recent history, a local community deep in the heart of Illinois coal country, only miles from where Peabody sank its first historic coal mine in 1895, is saying no -- and forcing mainstream environmental organizations and citizens groups to take notice as it draws regional and national attention for its relentless grassroots efforts. Locals have drawn a line in the sand with a clear message: Mr. Peabody's coal trains ain't haulin' away our community. 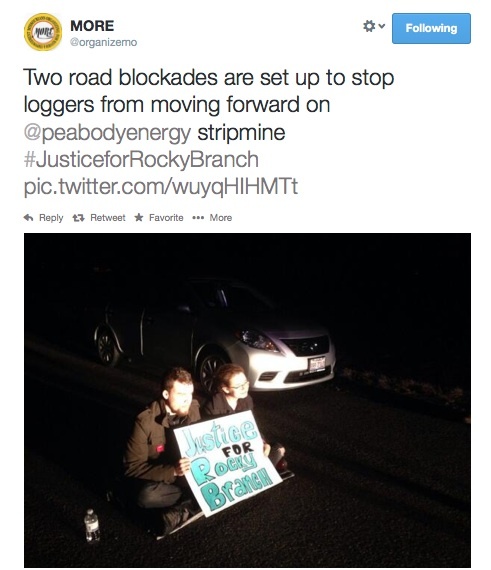 Earlier this morning, Rocky Branch supporters were arrested for blockading the county road to draw attention to clear-cut logging of Shawnee forests by Peabody, prior to the final EPA permitting of the strip mine operation, as well as the destruction of habitats for endangered Indiana bats, and dangerously overloaded equipment on county roads. Illinois-native filmmaker Mitch Wenkus journeyed to southern Illinois recently, to chronicle the epic Rocky Branch showdown, including the role of Judy Kellen. Wenkus released this short film, "Judy's Rock," as part of his documentation. "We have lost population, we have lost homes and we have lost roads," Kellen said. "When the mining company is gone who is going to pick up the tab for loss of revenue from homes and roads in order to continue to maintain the roads we still have? We were told when we lose old 13 and it is ripped out that the state would replace it. Our state is broke. We have lost a view of where we could see for miles. We have lost history. We had a cemetery in a beautiful location that now has been turned into something akin to an abyss. We have to endure dust, noise levels to the pitch you wanted to scream because you couldn't get any rest or sleep, earth tremors, home damages, complete isolation of any type of view to the north, health issues, a sadness in your heart that puts a dread on your face everyday and an unrest in the spirit that we knew nothing of." Earlier this month, despite threats of violence, locals set up road blocks to call attention to Peabody-hired loggers, whose heavy equipment violated county road tonnage limits. Last week, thanks to an extraordinary grassroots campaign, Kellen and other affected locals including Jennifer Dumbris and farmer/preacher Allan Porter, delivered over 5,000 petition signatures to state Attorney General Lisa Madigan, calling for an immediate halt to the operations and an administrative review of the rushed state permit.